Geothermal energy is the poor stepchild of low carbon footprint “alternative energy”. Why? Well, I suspect the fact it involves an actual drilling rig common to the oil patch has something to do with the ocular vision of those who prefer raptor killing windmills or expensive short lived solar panels. Geothermal involves a passive method where a hole is drilled, and a U tube of pipe is sent to the bottom drawing the warmth or coolness of the earth to operate a heat pump at the surface. In residential installations, this may involve a few 200’ deep boreholes and the U tube of plastic is enclosed in bentonite (swelling) clay. It works very well to reduce energy usage in a dwelling. But as a large scale operation, it is not so hot…bad pun. The Geysers in California is virtually the only U. S. based industrial scale operation where hot steam water is used to generate steam and run turbines for electricity. Nevada and Utah do have some geothermal power plants. In Iceland, this method produces almost all the energy and heating for the island nation. Iceland has been working on a well that is approaching 5,000 meters (over 15,000’) depths and has penetrated rocks that are extremely hot. A similar effort failed a few years ago when it actually broke through and into a magma chamber resulting in the blowout from hell. It destroyed the drilling rig. This effort will attempt to use the borehole to boil water and run a turbine capable of 10x the energy of a regular steam well found on the volcanic rocks of Iceland. This will involve supercritical hydrothermal fluids as an energy source. Pix from Renewable Energy World. Is there potential here? Yes, but there is also the potential that horizontal drilling could create an even better system. That could involve a horizontal well that could intercept a vertical hole creating a natural loop, and pumping water in the hole and taking steam out the other surface hole. Where do we have high temperatures (over 212° F.) The map below shows that most of the West has potential and much of the Texas Gulf Coast. The Ouachita Mtns of Arkansas also have deep high temperatures. 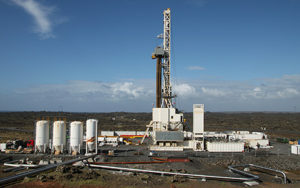 The potential for development of geothermal energy is very high. Map from SMU.